The base of this recipe is good enough to eat on its own as a soup. If you add a crust you have pot pie, toss in some biscuits and now you have chicken and dumplings. 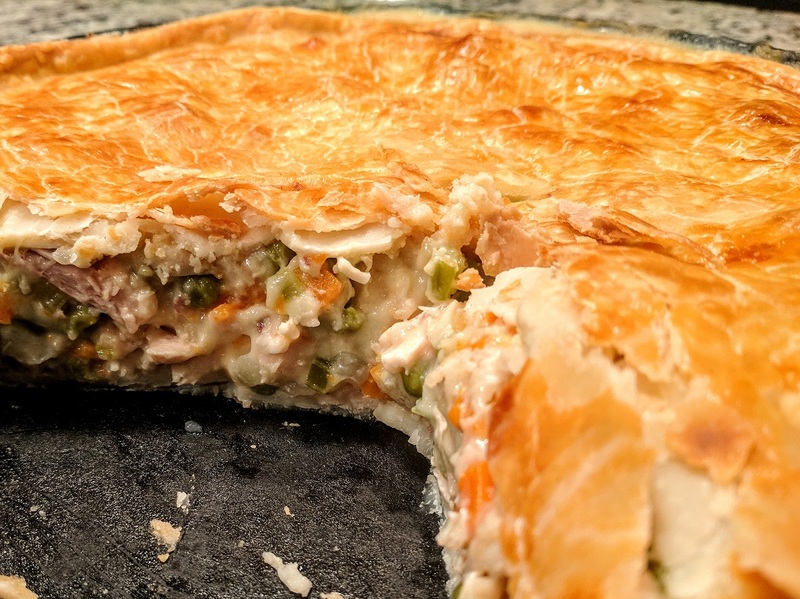 Don’t be afraid to simplify and use a rotisserie chicken and pre-made pie crusts from the grocery store. In a large pot, heat 2 tablespoons of butter over medium heat. Add the onions, celery, and carrot and sweat until the onions are translucent, 5 to 6 minutes. Add the garlic and sauté until fragrant, 1 minute more. Remove the vegetables from the pot. Heat the remaining 4 tablespoons butter over medium heat. Once melted, whisk in the flour. Cook until the mixture is just starting to turn golden brown, 2 to 3 minutes. Gradually whisk in the chicken broth. Bring the mixture to a simmer. Add the vegetables back to the pot, along with the bay leaf, rosemary, and thyme. Simmer for 15 minutes. Stir in the cream, chicken, and peas and return to a simmer. Simmer for 4 to 5 minutes more. Remove the mixture from the heat. Cool completely, if possible, if not proceed below. Roll out pie dough and place on the bottom of the pan or oven safe dish. Place filling on top of crust. Place second dough on top of filled pan, press & seal edges and trim away the extra crust. Egg-wash the top crust and cut a few vents in the crust. Place pan on a baking sheet and transfer to oven. Bake for 45-50 minutes or until golden brown. Let cool for 30-45 minutes and serve.